The latest development by the pioneering designers, engineers, and management team at Fives. It is a safe, productive and reliable system flexible enough to adapt to any pipe packaging application. The machine can process rounds, squares and rectangles in a hex, square or rectangular bundle. It has a straightforward easily accessible setup procedure in manual or an optional semi-automatic or automatic mode. 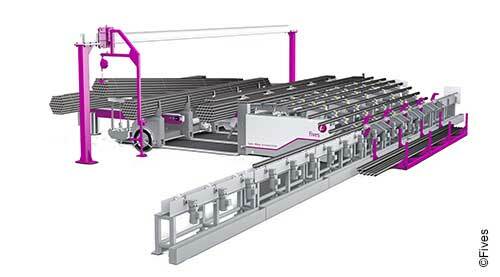 The bundle is built-up by mechanical layering technology and transferred downstream to flexible material handling options.